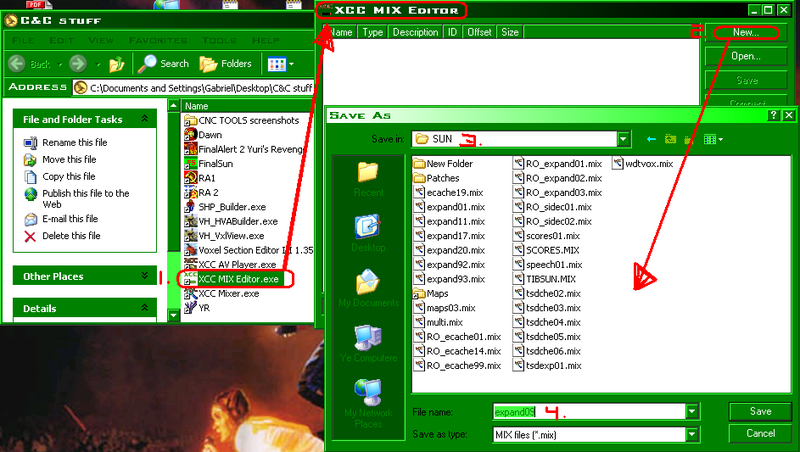 1. in the left column in XCC mixer, you can browse through your computer, just like in Windows Explorer. You can either hit Backspace, or the ".." to go back in your search. You can use this to open any Westwood mix file, as if it was an ordinary folder, just select it and it'll open. 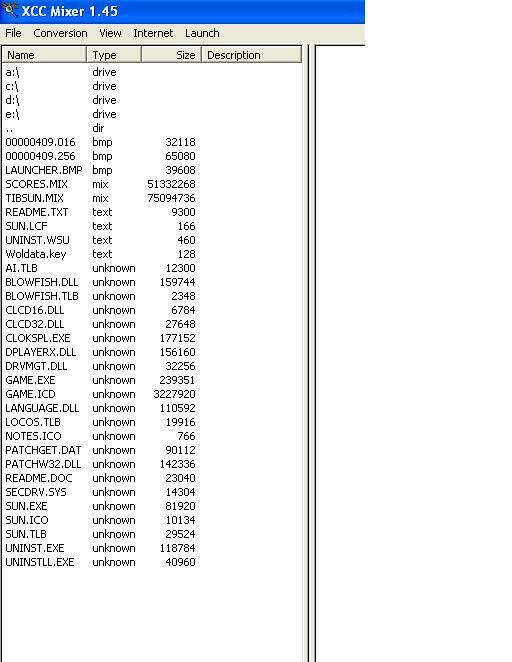 "TIBSUN.MIX" holds pretty much all of TS's files. 2. The easiest way to extract a file is to right click on it. You'll get several options on what you can do wit this file. 3. Click "Extract.." to get the 'save as' window. 4. it will make a copy of your file in the directory you specify. For myself, I made a separate folder called 'Extracted' where I extract stuff to, this helps to organize all the stuff I've extracted. Open XCC Mix editor. It'll take you to a blank table. Hit "New" to get started. It'll give you a 'save as' window, asking yo where you want to put the mix, and what you want its name to be. The name is VERY IMPORTANT!!!!! it tells the game to read the files inside. Put all your shp in "ecache##.mix"
pretty much everything else goes in "expand##.mix"
## means any two digit number between 02 -99. Do NOT use 01 because that's what the firestorm expansion uses. Anything in these mixes will override other files with the same name. For example, if you make a new voxel called bggy.vxl, it will OVERRIDE Tiberian Sun's Nod buggy (bggy.vxl) and display your new voxel as the Nod buggy instead. I want to put voxels in this mix, so I'm calling it "expand09"
1. Simply select the files you want to add, click & drag them into the Mix Editor box. 3. After you save, I like to hit "Compact". It's not always necessary, but it's always good to do. Maybe soon a windows explorer integration? I have been overlooking this topic multiple times and i see that you have expandxx.mix i cannot find mine? why is this ? Nope, XCC can make new mix files, XCC Mix Editor is not needed. Yeah, I'll have to remake this tutorial someday excluding Mix Editor..
although, I'm not sure if there is a 'compress' feature in the mixer like in the editor, is there? Dont need it, it automatically does it. i wanted to say thanks to gufu and Team Black i finally figured it out, and now it works perfectly fine. All i did was use mix editor and made a new expand01.mix file and from their i just added my voxels and hva's and just compact and close, it automatically saved the files and put them into tiberian sun, and for me it works great so thanks again to gufu and Team Black, on a side note this is helping me out alot with my first detailed mod so iam taking my time and patience to do this correctly, and all i can say for now is their is 3 sides and maybe a fourth. Don't use Expand01.mix, that is already used by FireStorm. Rename it to Expand02.mix or another two digit number higher than one. XCC Mix Editor is essential for compacting big mixfiles after editing... XCC Mixer tends to be quite wasteful with space. I think this problem is usually caused by XCC Mixer only removing the mix index references to removed files, rather than REALLY removing them. For example... the RA1 main.mix file in the First Decade pack, made with XCC Mixer, is 1.23 GB. If you open it in XCC Mix editor and press Compact it's reduced to about 870 MB. At least it isn't someone asking how to use tibed and having a tutorial for the most basic things at least reduces the probability of useless how do I use xcc mixer posts. Even Nyerguds who game hacks, hex hacks has a more mature attitude then you. You realize I don't care what you think right? My point which was a post to everyone (yes Icyson its not just about you) in general but using your post as a example, is how your so called elitism, snide remarks aren't amusing but rather pathetic and not useful, its like gufu random posts. Your comment could have been done on msn, pm and yes its a Internet forum so I don't really care if you care. Also the only reason I disagree with your post here is because tutorials are for new modders who are actually willing to learn but have no idea how to use the tools given and want to be taught. Its like giving a surgeons tools to a trainee surgeon who is still studying. On the other hand the numerous noobs on PPM posting stupid questions, mod announcements, etc are like kids who have been given a gun. Finally there are some features in XCC Mixer which only a few users will ever touch. Finally 1.45 is rather buggy at best (its crashes when carrying out certain functions and support for other games for which you won't need. Unzip it into a folder, call it say MOD, run xcc mixer and then just use right click - copy and the files will be directly copied to this folder and thus you won't need to use extract. Did you learn XCC Mixer from a tutorial? Probably not, there weren't many useful ones around the time we started modding. I learned XCC by simply using it on my own. So my statement still stands, that it's sad that the new modders are incapable of figuring something out without full blown over-detailed tutorials. What I posted was somewhere along the lines of what DCoder might post and/or think. I don't see you attacking his posts. QFT, same here. in fact, even though i stopped, i learned modding in general this way. and IMHO, someone who doesnt have the brain to figure stuff like that out, doesnt deserve to mod, as he wont be able to produce anything worth looking at anyway. To be fair Id have to agree that the XCC Mixer is incredibly easy to use, I worked out how to use it in under 10 minutes after getting it. But I suppose I also have to agree that if someone asked for a tutorial on it, it is nice to post one and not just say, go work it out yourself. On question to see whether I agree with this statement or not. Is any of the stuff I've done worth looking at? And yes, I worked it out myself too, however I gave it to a fried and he repeatedly asked how you use it for quite a while until he figured it out. Well no need to reinvent the wheel. At least the question being asked related to a common TS/RA2/YR modding tool and not something mind numbingly easy and not mention make you worse at modding such as TibEd. To be fair I am shocked as to why the person asking didn't go to http://xhp.xwis.net/ and just check the section saying Guide: Using XCC Mixer cos afaik I used that in the very beginning but then again maybe many new modders are unused to the tools. The posts I hate are spoon fed threads where people ask code my ai or a list of questions without trying e.g. showing sample code. Since this is a tutorial thread though, I expect more useful, constructive comments to be posted here unless the tutorial is bug ridden/useless. The tutorial basically says what anyone with half a brain can figure out in 10 minutes of messing around with XCC... so I don't think Icy's remark is that odd. yes, your stuff is far from bad. Kind of interresting reading this pros and cons about tooling and modding. -and the use of tutorials in general. I have to admit I'm a beginner in modding even though I learned to handle XCC very fast. But with the rest (how to understand the ini files, etc.) I think tutorials are the core for people who what to learn. And by the way: how much time can you invest in modding ? I still have other responsibilies besides so I'm very thankfull for every good tutorial that helps to understand and learn more. How come I don't have the rules.ini file in my TIBSUN.MIX ? All of the voxels in regular TS are also in the LOCAL.MIX, but the SHPs of units are in CONQUER.MIX, while the buildings are in the TEMPERATE.MIX and SNOW.MIX, but you can find their build ups and the cameos in CONQUER.MIX.